This heavy-duty sealant comes in a suitably businesslike package. It is an essential aid to operators of vehicles that suffer harsh off-road terrain. It is by far the Agriculture market leader. The OKO Off Road product can be relied upon to seal holes with a diameter of up to 10mm (in tubeless tyres). However, unlike some other companies, OKO does not over-claim on behalf of its products. In tests, OKO Off Road has shown that it can seal holes of up to 20mm in bigger tyres. Even if it cannot always achieve this, it will slow down deflation to allow the driver to bring the vehicle safely to rest. Off Road OKO is primarily designed for use off the highway. It can be used on road for slower-moving on/off road trucks and service vehicles, and is often used in countries with bad road surfaces; it is preferred to other sealants for use inside inner tubes. It is not for regular use on any surface in excess of 80 km/hour, or 50 mph. 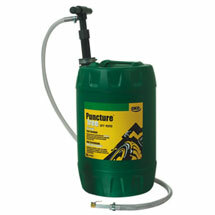 The green Off Road 25 litre drum is used in combination with a new adjustable heavy-duty all-alloy pump, which delivers 250ml per stroke for rapid and accurate filling through the valve stem, and works against pressure of up to 60 psi/4.21 bar. (Not to be compared with competitive pumps that you have to assemble, are plastic or rust-prone steel, deliver smaller doses, are not adjustable and do not handle such high pressures). Because OKO is water-soluble, the pump washes clean for repeated use, and if the tyre is removed from the rim in the future both the tyre and the wheel can be hosed clean. Anti-corrosion agents prevent any damage to either. Precise calculations depend on the tyre size and type but typically OKO can be fitted to all 4 agricultural or large industrial tyres for much less than the cost of replacing one tyre, even using a remould. NO ADVERSE AFFECT UPON TYRES OR RIMS (contains anti-corrosion agents that protect steel and alloy wheels). WORKS WITH INNER TUBES and TUBELESS TYRES. For slower-moving trucks and other vehicles going on/off road that have inner tubes, this product is recommended. (Larger holes in tubes will not be sealed). Remoulds: causes no problems, can be washed out. Vulcanising: First remove OKO with water, then dry tyre with “BUFSOL” solution. Colour: Natural off-white. Viscous. Low Odour.